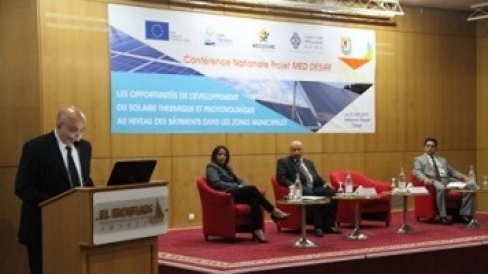 The National Agency for Energy Conservation (ANME) on April 22nd 2015 organized an awareness-raising event titled “The Opportunities of Development of Solar Thermal and PV in Buildings of Municipal Areas”, held in Hammam Sousse - Tunisia. Opened by the Governor of Sousse and the General Manager of ANME, the event was an occasion to discuss how to overcome the possible barriers to the implementation of solar ordinances for distributed solar energy technologies in municipal areas. It was also an opportunity to highlight the contribution of solar ordinances in reaching the national objectives. 116 participants took part on the National Conference, including several relevant private and public stakeholders representatives, municipalities and SMEs. Through this National Conference, the participants were made aware of the importance to implement solar ordinances and there was a shared agreement that the use of renewable energy is crucial for the sustainable development of the building sector. Thus, a pilot project in the municipality of Hammam Sousse could help the diffusion of solar distributed technologies. Therefore, there is a need to adapt legal, institutional and regulatory frameworks and to raise the awareness of policy makers and civil society in order to support the implementation of this initiative.